Don Bradman’s connection with Ceylon (Sri Lanka) | The International Cricket Hall of Fame. 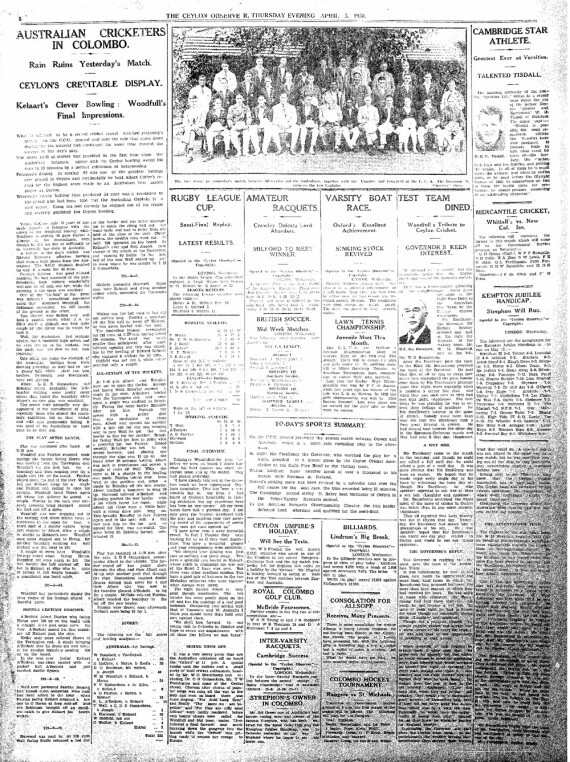 The Sri Lanka High Commission in Canberra has kindly provided the Museum with some valuable newspaper stories of the Australian side playing Ceylon in 1930 and 1948. In addition they have given a rare historic photograph of Don Bradman setting foot on the Worcester Ground in 1930, his first match on English soil (show). In the days when international travel was solely by ship, Australian and England cricket teams always made port at Colombo in Ceylon (now Sri Lanka). After the long sea voyage, players were eager to stretch their legs and the cricket-mad locals very keen to take on the tourists. The venue was invariably the Colombo Cricket Club Ground in the capital city. In March 1930 Colombo became the first overseas cricket venue in which the young Don Bradman played. He scored 40 runs before being out hit wicket (he was only out this way twice in first-class and Test cricket). Opening batsman Bill Ponsford top scored with 62 runs. The match was drawn when a tropical downpour suddenly halted play. Fast forward to March 1948 and Don Bradman, now Australian Captain, was leading an incomparable side to England. Australia batted first and made 8 (dec) for 184 (Sid Barnes 46* and Don Bradman 20). Ceylon replied with 2 for 46 before, once again, rain stopped play. The shuttling of English and Australian cricket teams via Ceylon, sharpened their population’s appetite for cricket and Ceylonese cricketers steadily honed their skills. By 1972 when an independent Sri Lanka was proclaimed, cricket was by far the most popular sport. Today the cricketing world deeply respects the great Sri Lankan players including Kumar Sangakkara, Mahela Jayawardene and world Test record wicket-taker Muttiah Muralitharan. 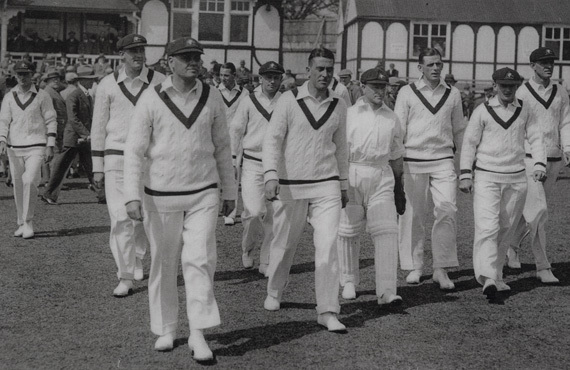 Australian Captain Bill Woodfull leads the Australian team onto the ground at Worcester, England in April 1930. Pictured are (l-r); Clarrie Grimmett, Alan Fairfax, Bill Woodfull (c), Archie Jackson, Don Bradman, Victor Richardson, Bert Oldfield, Tim Wall, Stan McCabe, Percy Hornibrook. (Edward a’Beckett is obscured). Courtesy Sri Lanka High Commission, Canberra.